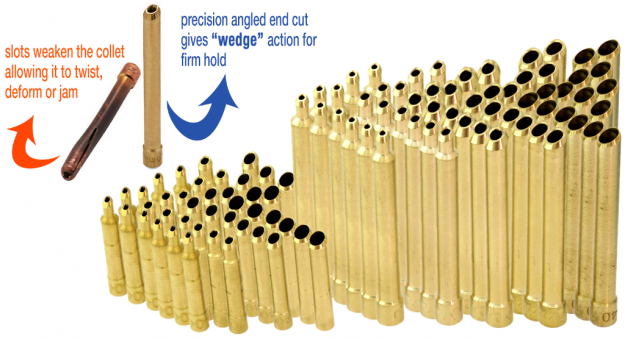 Why would you want to use a Wedge Collet? 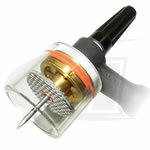 You can purchase the wedge collet separately for your TIG torch or you can get it as an essential part of your Kits at Arc-Zone.com. One of our favorite products from CK Worldwide is the Gas Saver Kit, which provides a large inert atmosphere with consistent gas flow over your weld zone. It’s great for welding reactive metals like titanium, molybdenum, nickel-based and aluminum based alloys, as well as non-reactive metals like stainless steel. If you rig up your TIG torch with the Standard Gas Saver™ kit, with its ½” Pyrex® glass nozzle you can save up to 40% of shield gas consumption. You’ll also experience better gas flow patterns and you can allow your electrode to extend up to six (6) times your electrode diameter. Gas Saver™ kits are easy to install and add very little extra to your torch—you’ll still experience the comfort and control you’re accustomed to. The Large Diameter Gas Saver™ nozzle has a 1-1/8” (28.5mm) orifice and is used to provide the ultimate shield gas coverage for your weld. With either the Large or Standard Gas Saver kit you’ll see better than ever: the weld puddle and tungsten electrode, inside corners, inside pipe and around tubing. Gas Saver™ kits are available in tungsten electrode sizes from .040″ (1.0mm) to 1/8″ (3.2mm). For those that want it all. 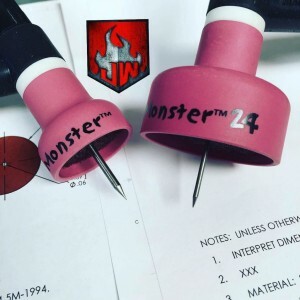 You get one of each Monster TIG nozzle size, wedge collets, and all the torch parts needed to start welding. Each kit is packaged in a convenient, high-quality kit box with a technical “how to” and lid card for easy re-ordering.